Rosewater is one of those ingredients (and I will not even name the other ones, in case they never make it to the daylight), that has been sitting in my pantry for months, if not years (regularly replaced if it was past the expiry date), waiting for the big day. I have been convinced all the way that the use of rosewater would be an enhancement to the dishes I would use it in. Yet, it took me forever to get started. And now has happened what I knew would happen: I throw rosewater into wherever I can. It all started with the pistachio cake. I took all its flavor-giving ingredients from the cake and put it into the granola: lemon, rosewater and pistachios. Simple as that. Rosewater is a great way of flavoring foods without adding a whole lot calories. I love its subtleness, while at the same time providing an invigorating freshness. 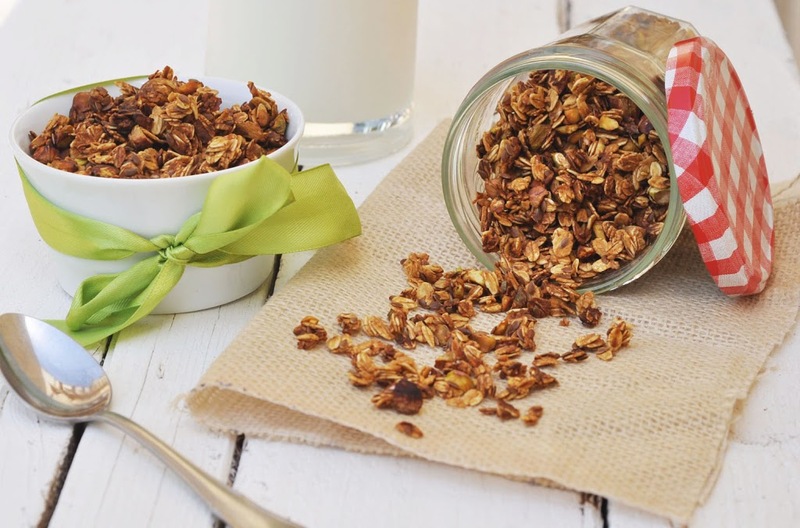 Combined with lemon, this granola will surely help you wake up in the morning and have a good start of the day. Preheat oven to 150C. Line large baking sheet with parchment paper. Combine lemon zest, lemon juice, rosewater and syrup/honey in a saucepan. Bring to a boil. Take off the heat and let cool a little. Set aside. In a big bowl, combine oats, flax seeds, and chopped pistachios. Pour the lemon syrup mixture over the oat nut mixture and stir until well combined. Let sit for 5 to 10 minutes. Spread the granola evenly on a baking sheet and bake for 20 to 25 minutes. Let cool completely. Stir in raisins (optional).